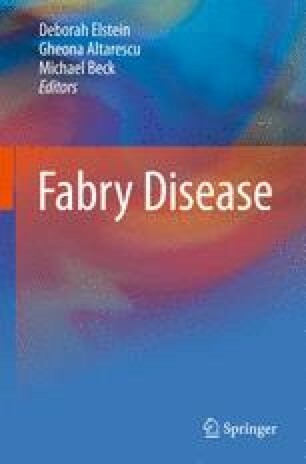 Anderson-Fabry Disease (FD) is an X-linked glycosphingolipid storage disorder caused by a deficiency of α-galactosidase A. This deficiency results in a slowly progressive disease due to the accumulation of globotriaosylceramide (Gb3) in cells of various tissues and occurs in both males and females. The early non specific gastrointestinal symptoms and unexplained pain of this progressive condition often results in a delay in diagnosis by up to a decade. The safety and efficacy of treatment with Enzyme Replacement Therapy (ERT) with both agalsidase alfa and agalsidase beta has been well documented in adults. More recent studies have also shown the response to ERT in adults to be less effective when started in the later stages of disease progression. The optimal timing and dosing of ERT to delay or stop cardiac and renal complications of FD is currently unknown. The early clinical presentation of FD is heterogeneous with life threatening complications seen in adults being uncommon in children. The published literature of studies in children is currently limited but demonstrates safety and encouraging early efficacy data. Long term follow up data on the safety and efficacy of ERT in children is essential and this emphasizes the importance of accurate and meticulous data collection, both as individual treating clinicians and also for collating data on such rare diseases using the disease-specific global registries.